One view of Domino's Farms Office Park, which is visible from US-23 in Ann Arbor Charter Township. Ann Arbor-based physician network Integrated Health Associates has entered preliminary discussions to construct a new 42,000-square-foot office building in Ann Arbor Township. The discussions, said Township Supervisor Mike Moran, center on constructing a 42,000-square-foot office building on the 270-acre at Domino’s Farms Office Park, which already serves as the headquarters for IHA. IHA, formed in 1994, has 32 offices with 156 physicians and 727 staff members serving more than 260,000 patients. 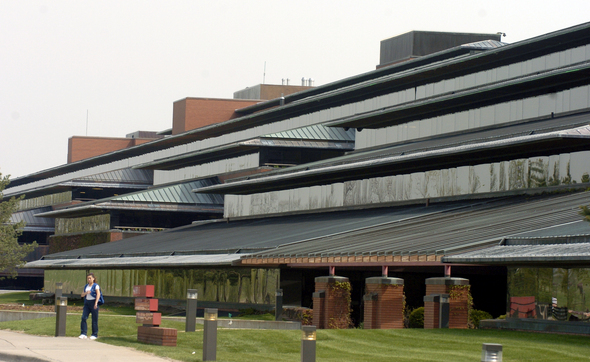 Novi-based Catholic health care group Trinity Health’s St. Joseph Mercy Health System acquired IHA in 2010. Moran called the Township discussions with IHA a “pre-application meeting,” and the item also appeared on the Ann Arbor Township Planning Commission’s agenda on March 5. Domino's Farms director John Petz declined to comment. Developed by Domino’s Pizza founder Tom Monaghan, Domino’s Farms Office Park is located between Plymouth Road and M-14 on the east side of US-23. It has nearly 1 million square feet of office space with enough land to continue development on the property. Tue, Mar 20, 2012 : 4:56 p.m. Wed, Mar 21, 2012 : 12:06 p.m.
Yes,so much more convenient for patients and staff to have multiple facilities spread all all over the place rather than one location where all treatment and administration can be handled. Are you serious or just making a very bad joke? Tue, Mar 20, 2012 : 3:59 p.m. This will make traffic on Plymouth road even more fun! Maybe we can put in a bunch of traffic circles too! Tue, Mar 20, 2012 : 7:48 p.m. This post might get deleted but I have to say it anyway, might want to put that school the Pittsfield counsel is having fun with right in that unused space. More traffic nightmares for all. Tue, Mar 20, 2012 : 11:19 a.m.
Is there not enough space in the existing building? I thought a good portion of Dominos Farms was unoccupied at the moment. You thought 42,000 square feet was just sitting available, seriously? Tue, Mar 20, 2012 : 10:37 p.m.
Nope, most of the space that was open has been filled by IHA and U of M.
Tue, Mar 20, 2012 : 4:01 p.m.
No, all that space is being used to store the old light displays. Tue, Mar 20, 2012 : 3:11 p.m. I didn't even know it unoccupied.